Da simmer dabei! Dat es prima! VIVA COLONIA! The fifth season of the year is already here!! Although many countries of the world are still celebrating Christmas and others are ready to start the celebration, we are ready for Carnival time. To be honest Carnival started a couple of months ago. The 11th of November at 11.11 hour Carnival started in NRW. 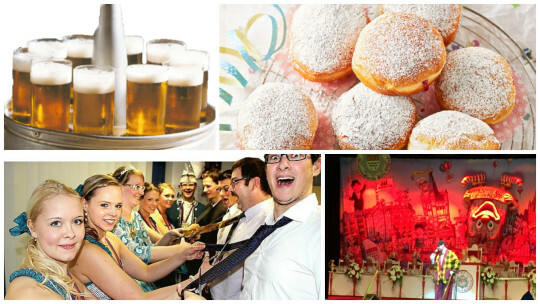 At that moment we stopped working and we started singing Carnival songs while eating Berliner and drinking beer. Another important fact for that day was the costume. The 11th November people wore a costume at the office and at 11.11 we went out and party until we decided to go home. Although December is a familiar month, after Christmas we are ready to celebrate and enjoy Carnival as much as possible! Stuffed Berliner are really tasty sweet buns. Some of them are stuffed with strawberry jam, others are stuffed with chocolate but… careful!! Some are stuffed with mustard!! So be careful to make a good choice when you pick one Berliner ;). Karneval Sitzungen are private parties organized by carnival troupes. Once you get an invitation you can spend a funny night attending to one of them. Usually they take place during four or five hours (from 20.00 until 1 am) inside the hall of a hotel/restaurant, where the carnival troup and different musicians and comedians live up the soiree. They are really fun!! And a rapidly way to learn Kölsch (the dialect of Köln). The day of women, do you remember it? Yes!! That day!! It is our time to cut men´s ties and to party!! The last day of Carnival… snifff… But still germans also know how to enjoy this day. A parade travels around the cities during Rosenmontag. Each troup has its own carriages and they throw candies to the children who wait for them on the street. Previo Previous post: Carnaval carnaval!